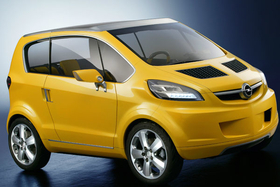 Opel unveiled a mincar concept called the Trixx at the 2004 Geneva auto show. PARIS -- Opel/Vauxhall's new minicar will be a competitor to Fiat's cult hit 500, the carmaker's sales and marketing head Alain Visser said. The General Motors Co. unit plans to launch a new entry in Europe's fast-growing minicar segment to rival models such as the Ford Ka and Volkswagen's forthcoming Up. But while most minicars apart are low cost, Opel has an upscale strategy for its model, which is code-named Junior. Visser said the minicar will be an "iPod on wheels" with high-tech features that will appeal to young buyers. "If you could compare it to one car, it would be the Fiat 500," Visser told Automotive News Europe in an interview at the Paris auto show. Germany, the UK and Italy would be the three biggest markets for the minicar, Visser said. He said there has been no decision on a production name. Opel's Vice-President of Design Mark Adams said the production Junior will not be a bargain basement vehicle. "It will be more of a modern and contemporary urban car to make the brand feel more hip and more chic," Adams said. "We want Opel to appeal on a more emotional level." Opel CEO Nick Reilly said the automaker has two strategies for the mini-vehicle segment. The Agila small minivan will continue to be an inexpensive model for small families while the Junior will be targeted at young people who don't associate a car's size with status. "It will have the latest infotainment systems and good fuel economy to make it environmentally friendly. For that, buyers will pay a little more," he said. A battery powered variant will be launched soon after the conventional model, Reilly said. The Junior starts production in 2013 at Opel's plant in Eisenach, Germany, alongside the three-door Corsa. Automakers normally have weaker profit margins on smaller cars because they cannot charge the same prices as they do for larger, high-end models but small cars can be made more profitable if they offer options and features normally associated with more expensive bigger models.